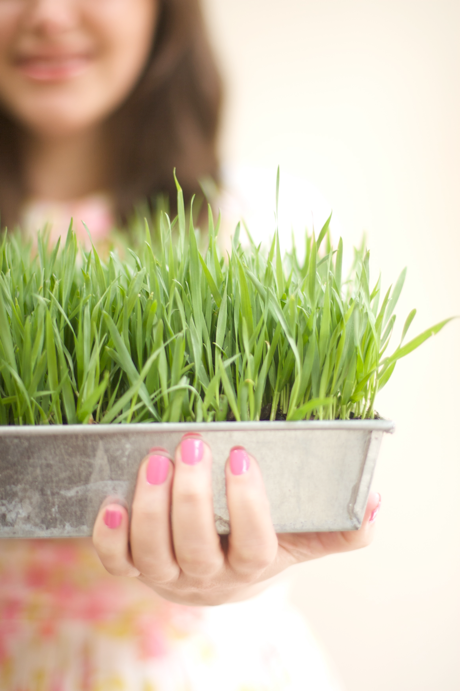 You can use wheat grass for so many things at parties and events. 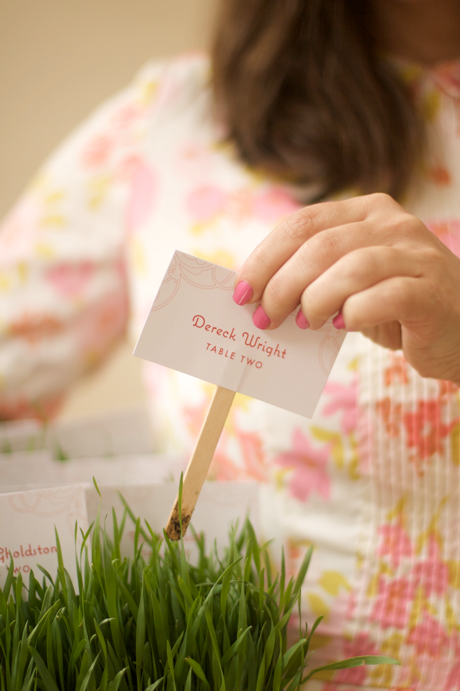 In this article for Project Wedding I show how to grow wheat grass and use it to hold seating cards. It is really simple and cheap! Perfect for a Spring or Summer event. I like how it worked fab and looked lovely holding the seating cards! Jordan, this is excellent! Such a great idea. Love the photos and colours, too. love your dress and pretty nails. so spring and happy. awesome, I've been wanting to grow some wheat grass! On a side note, what is that color of nail polish? It's so perfectly happy bubblegum pink. I love your short-n-practical girly manicure. Very sweet. Cute. But not practical. Handing over a popsicle stick with dirt on it? Not good. I would just place the cards in the grass that way they would not get dirt on them. It would also leave the guests free of worry (getting dirt on their belongings). 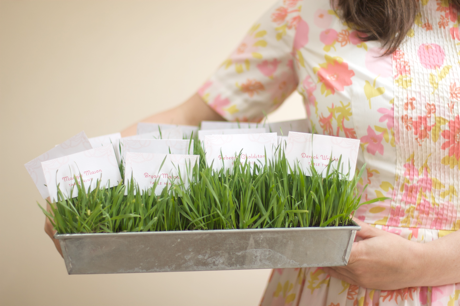 Ughh…I was SO set on having wheatgrass as centerpieces at our wedding. I thought it would go along with a springy garden party well, be cheap (therefore less guilt about spending loads of money onf flowers that are dead in two days) ..should I keep going? Anyway, I never got to fulfill that dream as I live in London and got married in the States and what seemed like a cheap and easy idea–not so much for a wedding afar. Three years later and I quite obviously haven't gotten over it yet. hmpgh. Looks lovely though, seriously. P.S. I did have very nice lime green and blue hydrangeas instead and I'm not looking a gift horse in the mouth, but…. I've worked at a couple events where we did this and it wasn't a problem. when I worked in New York City with a fashion company, we would create large wheat grass platforms and display our spring collections on it. It really added a bit of spring to the showroom and got buyers in the warm-weather mood when in reality the weather was cold outside. cute dress. cute grass. i'm coming to that party. Keep up the good work. Best of luck. From http://www.smartflowersdelhi.com. Ugh! Still can't get over the fact that you hang out with an ex-boyfriend of mine! I, too, want to know what color/brand the nailpolish is? I have the hardest time picking out the perfect pink like that at the store! We did this at our wedding. My dad grew 100 tiny terra cotta pots of bear grass, and we bought some sticks that looked like long twigs at Michael's to stick the name cards on. It looked great! I love this! I love that its reasonably priced but looks so neat and clean. When I have the opportunity, I'm definitely going to steal this cute idea! I just discovered your blog and have had the BEST time reading old posts. Love everything you share on here. And your babies are precious! I NEED to know what nail polish you have on in this post!! It is the BEST pink I have ever seen! !